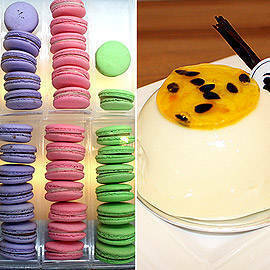 Chez Karine serves up the happiness with macarons, igloos and chocolate pudding. 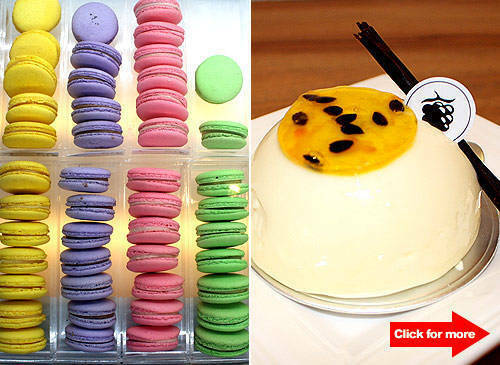 Click for macarons, mousse and more. (SPOT.ph) How does dessert make one happy? With sugar, unexpected flavors, and a chef that tirelessly tries to find new ways to make it fun. Desserts were always Chef Karen Yang's passion, which she pursued all the way to Paris, where she became an intern for Pierre Herme, a world class macaron artisan. Making other people happy was Chef Karen's goal when she first opened Chez Karine, an up and coming patisserie in Serendra that is generating buzz on the foodie circuit. We were lucky enough to be able to sample all the macarons, selling at P50 each (350 for a box of 7). The standout of flavor all these little treats is their Earl Grey Macaron. The macaron itself is light and fluffy, but the tea-infused filling makes it wonderfully fragrant and has an unexpected burst of flavor. Other flavors to sample are the Strawberry, Dark Chocolate and Salted Caramel. But macarons aren't the only dessert that Chez Karine serves up. If you were looking for something to munch on, check out Chez Karine's Chocolate Sablés (P90 for a pack of 3). Crumbly rounds of dark chocolate shortbread with melted chocolate chunks and sea salt provide instant happiness, especially when paired with their hot drinks. Our favorite has to be their Muscovado Latte (P105). For all the sweetness in its name, the coffee still manages to kick. We also love their Affogato (P110) with homemade vanilla ice cream and their Hot Chocolate (P115), which is made in-house with rich, melted coverture chocolate. Meanwhile, the Mango Panna Cotta (P100) is smooth on the tongue, with the vanilla custard of the panna cotta blending wonderfully with the mango. The Chocolate Pudding (P100) is creamy and has just the right amount of sweetness in it. For the grand finale of desserts, we were introduced to the Chez Karine staff favorite. Passionfruits are one of Chef Karen's favorite ingredients, and this inspired her to create the Passionfruit Igloo (P195), a tiny mound of delicious layers that blend together to create a creamy but tart dessert. The igloo has a crunchy almond and biscuit base, with a layer of passionfruit jelly in the middle. All of this is enveloped by a white chocolate mousse that's so light that it was a breeze to finish up everything. So if it's a question of happiness, we say that Chef Karen has achieved her goal. For a serving of artisan pastries and unique drinks, Chez Karine is a must try for foodies and sweet teeth alike.